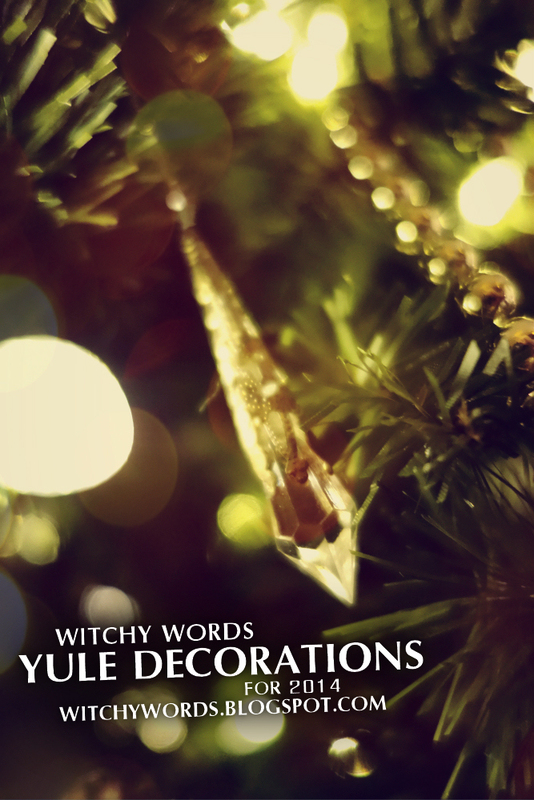 Need some Yule music to listen to while you read? Try here, here, here, and here. I've selected the music above because it fits what I listen to while putting up my decorations. It has become a tradition that, the day after Thanksgiving, my husband and I put on acoustic instrumental holiday music and decorate the house. In fact, I've been honing my Christmas Pandora station since it first began for only acoustic instrumental. For some reason, the sound of a guitar reminds me of a crackling fireplace. It's all I want during this season. 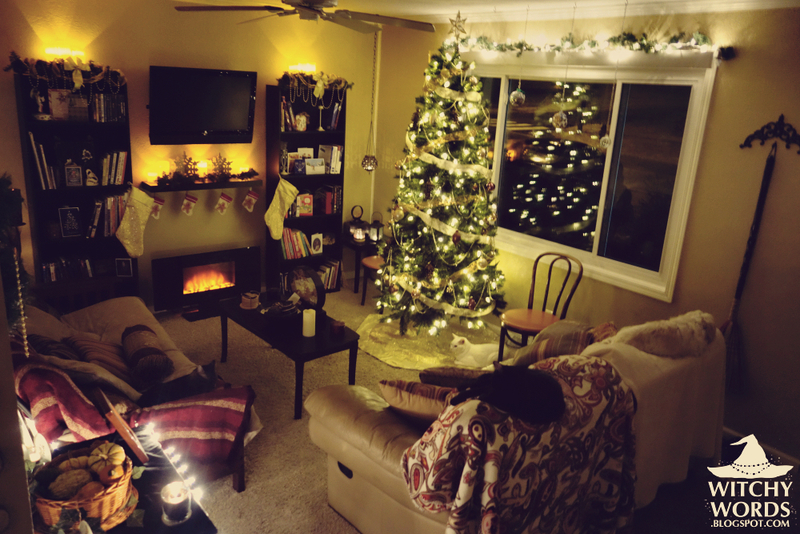 Let me walk you though our beautiful decorations, starting with the living room! 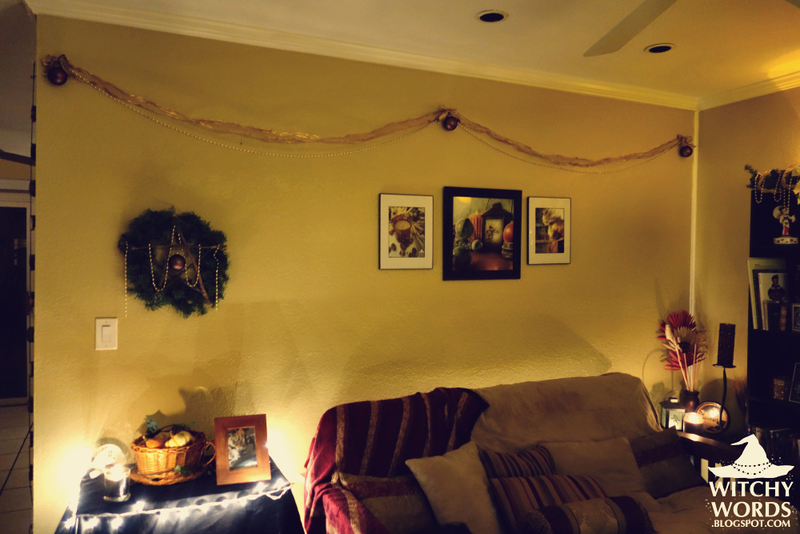 Since the first holiday season my husband and I shared together after our marriage, I've themed our decorations in gold, bronze, copper, brown and white. 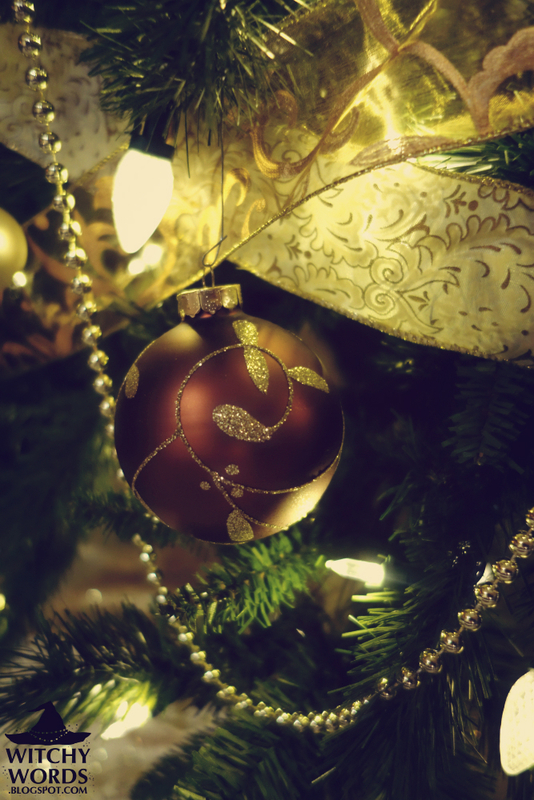 The gold evokes an image of the sun, which will slowly begin to return after the solstice, while bronze, copper and brown are the colors of the bare branches and earth during the cold season. White, of course, represents snow. ... and many of our ornaments! 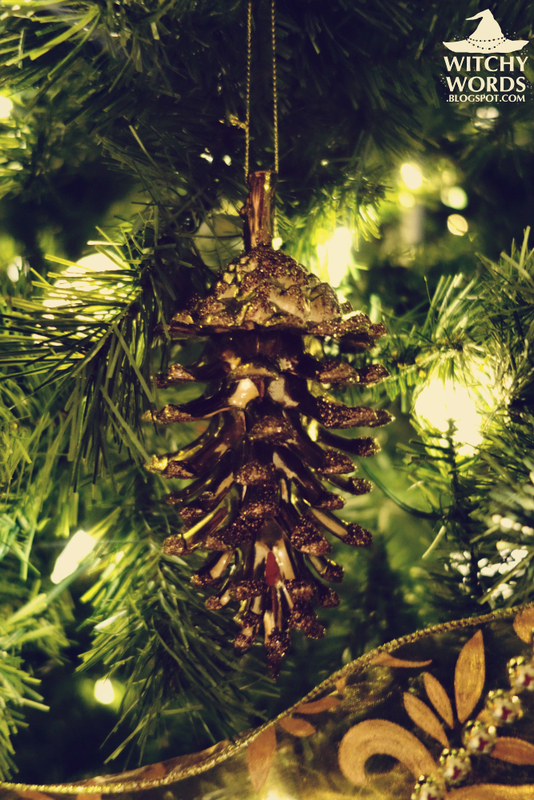 My favorite ornaments are the bronze glass pine cones. They're absolutely gorgeous, and I get excited every year when I unwrap them to hang. They're pretty sizable - they fill my whole hand! The ornaments, of course, represent the fruit of a tree. They become a sort of beckoning for a fruitful season once the sun returns. 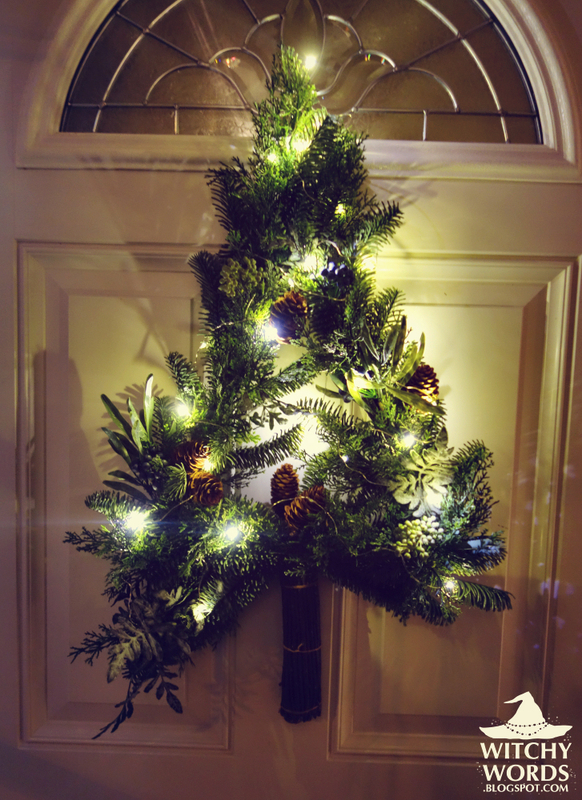 This year, we had the typical struggle of where to place the tree in our new living room. We decided on its position because it didn't block the couch and because I could still display my Witch's Balls in the window. 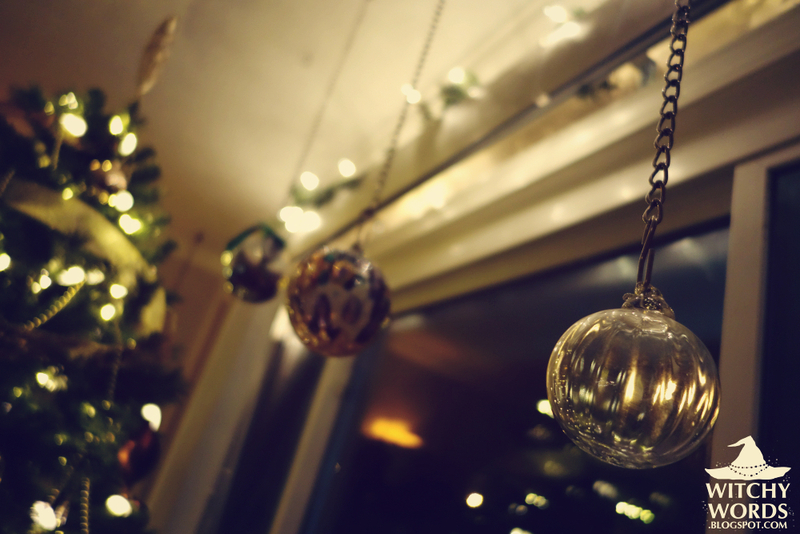 By the way, one of those balls is the Prosperity Orb from Yule 2012. 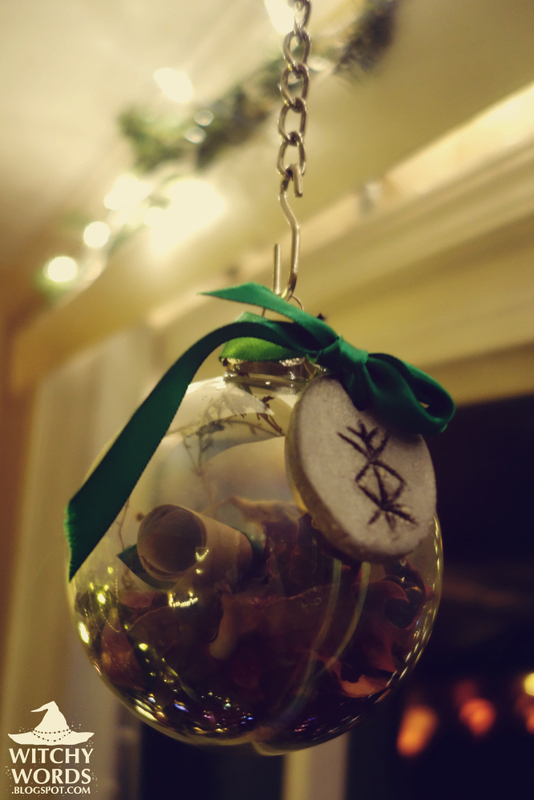 If you'd like to see how I made this orb, along with print outs for your own orb, click here! Though we had these bookcases last year, we didn't decorate them much. 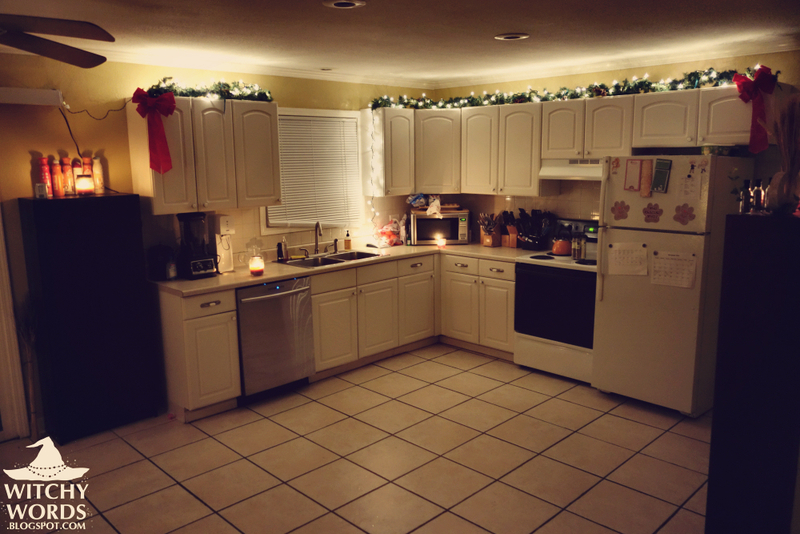 This year, I placed garland, beads and bows on the top tier, along with LED candles for lighting. It's simply safer given the height, plus they now come with remotes! How handy is that? 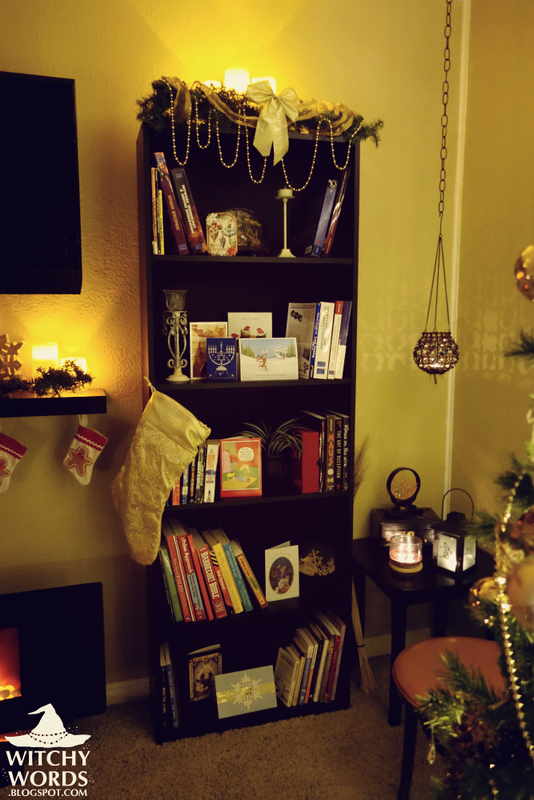 We'll also be using the bookcases to display holiday cards as well! You'll notice that this part of our living room has changed a bit from when I posted pictures during our housewarming party. I finally invested in a decent wall shelf to place between the TV and the faux fireplace/space heater. 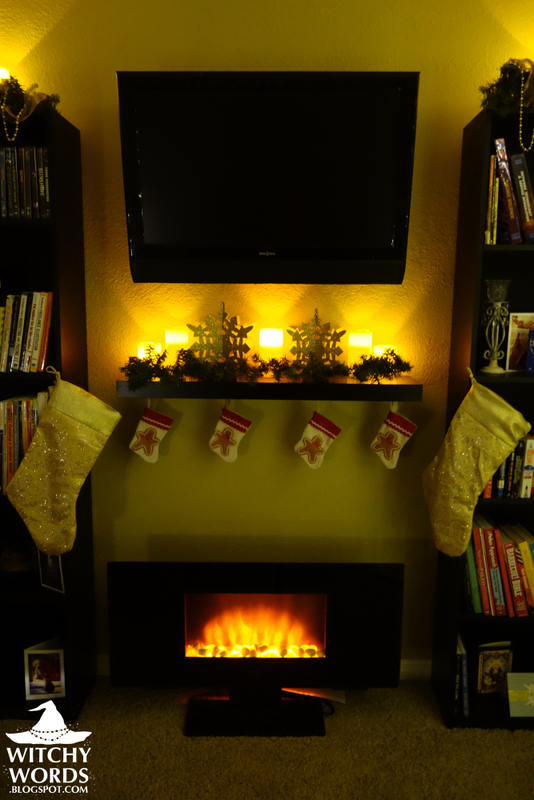 It was the perfect place for more LED candles and some decorations plus stockings! We of course hung our two on either side of the shelf, and the four for the familiars under the shelf. 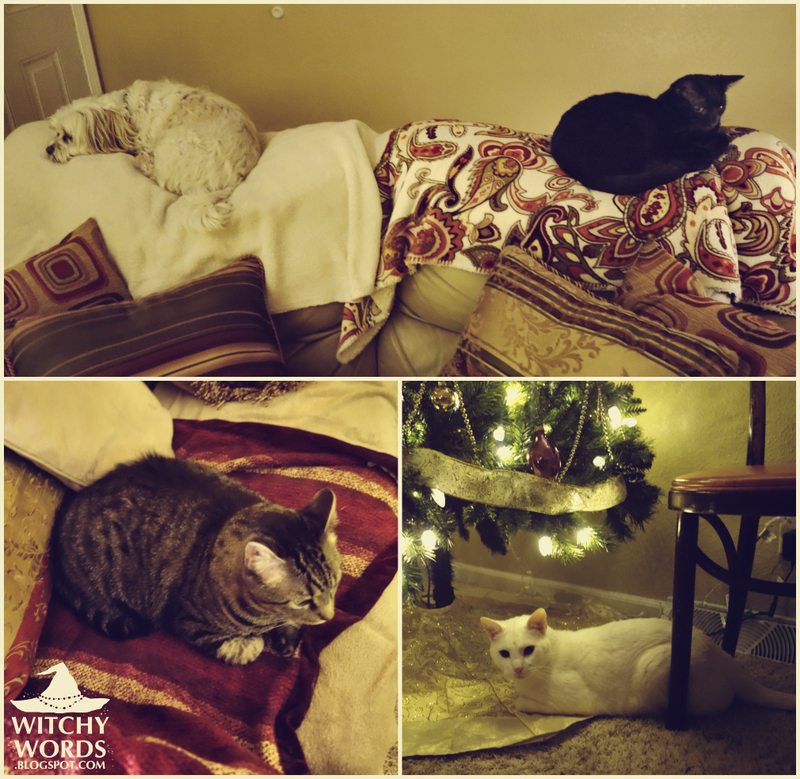 By the way, all four familiars did join me while I took pictures! 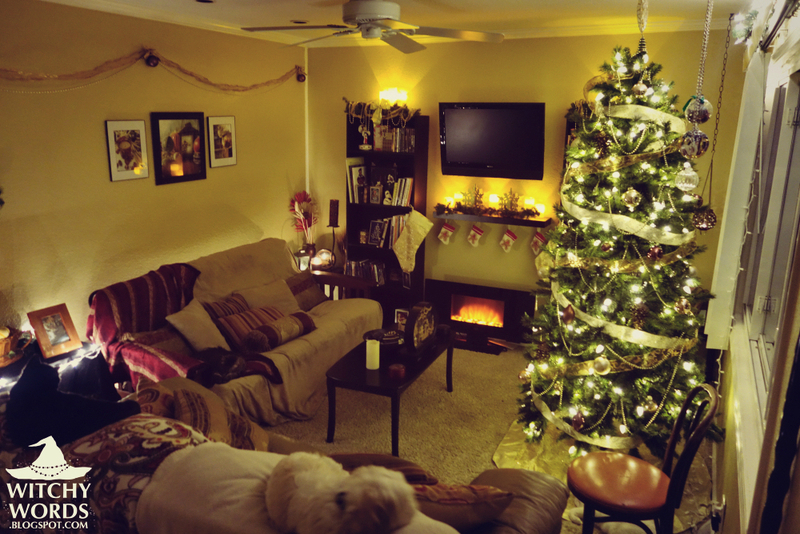 If you take a look at the first full view of the front room that I posted, you'll spot all of them there! 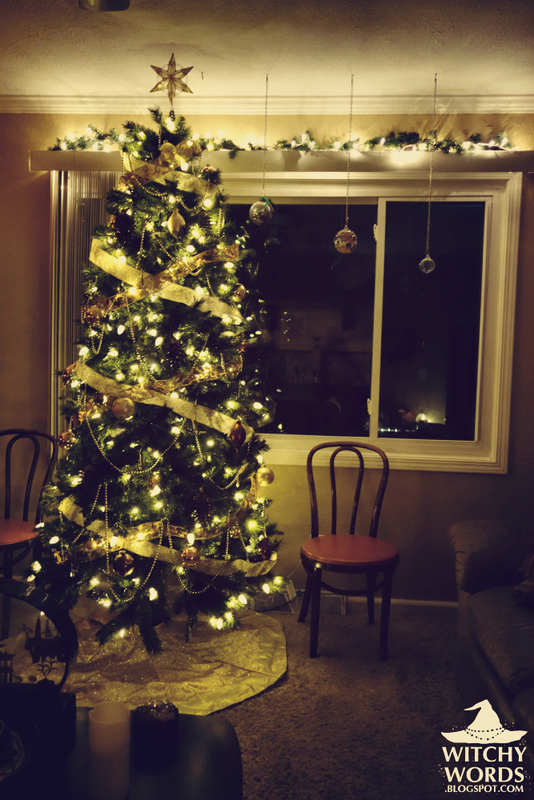 The ribbon you see over the couch was the original ribbon from our first tree. 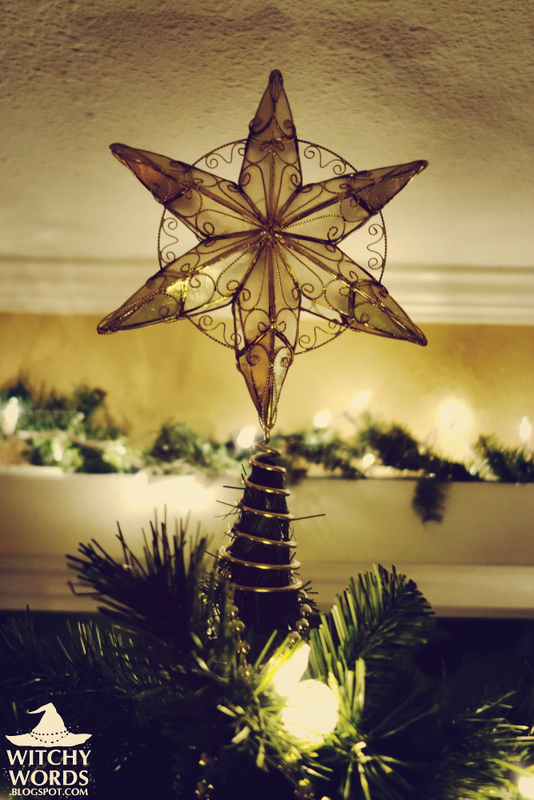 Every year, I invest in something a little new, but the old decorations are always used unless they've broken. I've also hung and decorated my pentacle wreath as well! 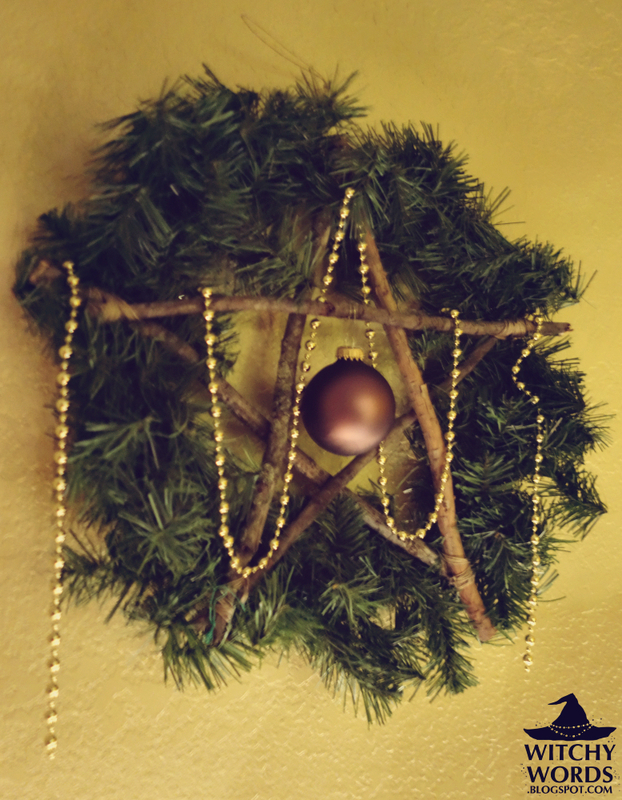 If you'd like to learn how to make a pentacle wreath like this, click here! The pentacle wreath hangs over the front room altar. 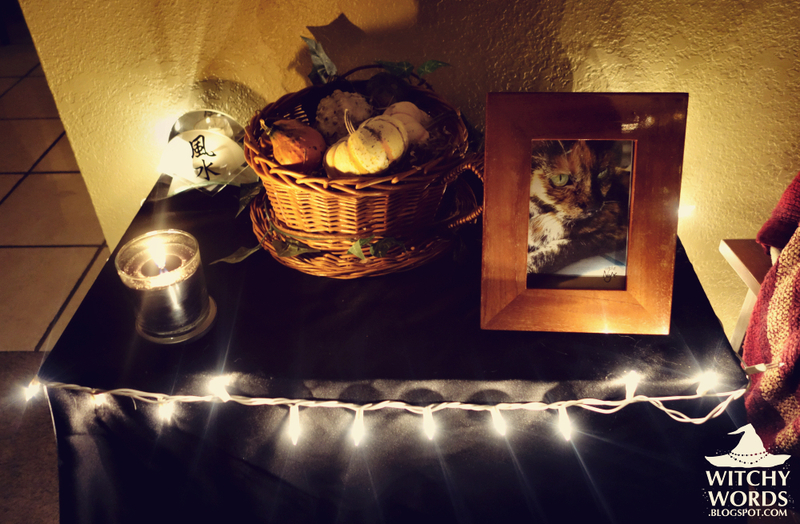 Right now, the altar is a tribute to the new and the old: It has the blessing basket my mom created for me for our house cleansing ceremony along with a picture of our beloved cat Nyx who passed away in 2012. This altar will be changed out for Yule here soon. When I decorate it, I'll be sure to post here with pictures! The kitchen has presented some new decoration obstacles this year. That space above the cabinet just calls to have something there! This year's decorative garland, complete with two bows and pine cones attached, is courtesy of my love for thrift stores! It came sans lights for $3. I used a wire cutter to separate the garland in the perfect place for above our cabinet and added the lights that we already had from prior years. Perfect! 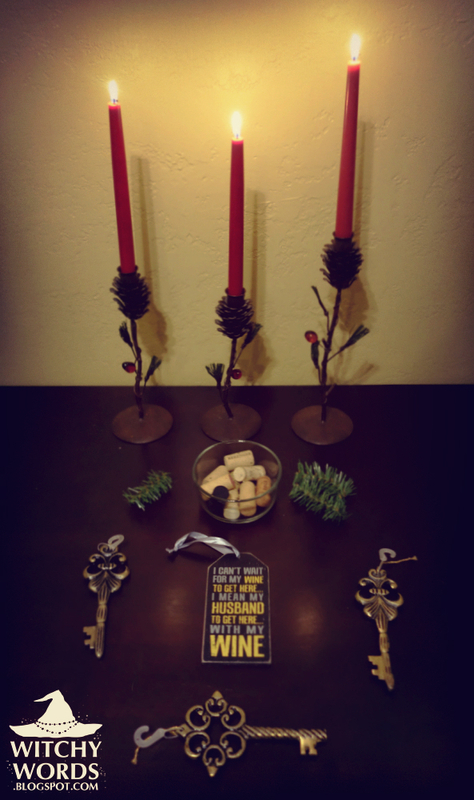 Of course, the kitchen altar is set up and lit for the holidays. 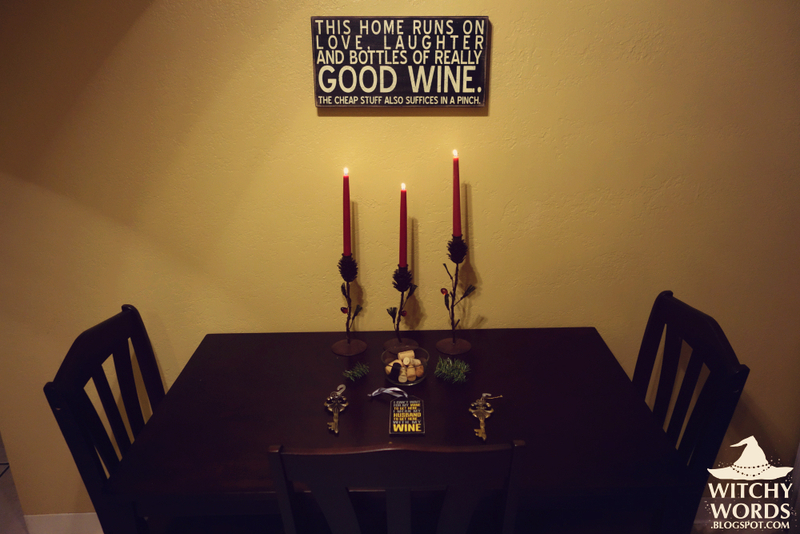 You can see my original kitchen altar post with full explanation here! I like the look of the natural wood, so the only decoration I truly needed to do for our kitchen table was replace the standard candelabras with more seasonal ones! I found these as a set at the thrift store for $7. It was a little pricier than I usually go for decorations but they were so absolutely perfect! I even picked up the taper candles unlit from the thrift store as a giant pack for $3. I found the keys at our local store for pretty cheap. The hooks are still on them because I'm not sure if I'll need them or not when I hang them up next to our main door outside! Until then, I think they look pretty snazzy here. Here's the outdoor view! Simple and to the point. 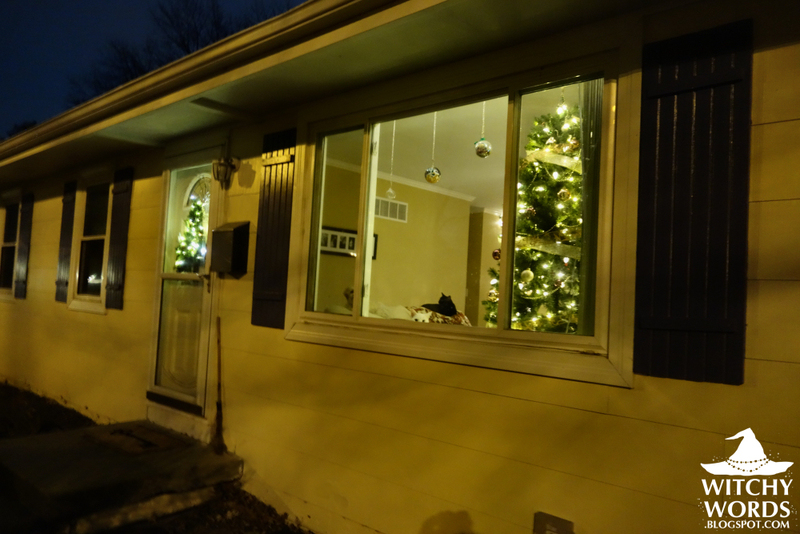 I don't like the hassle of putting up outdoor lights, but we do like to display the tree. 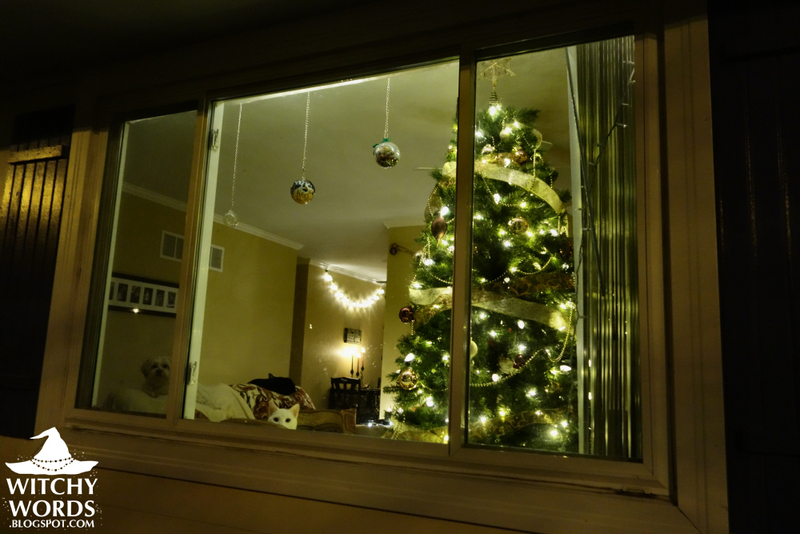 The pets are hilarious in the window anyway. Why distract? 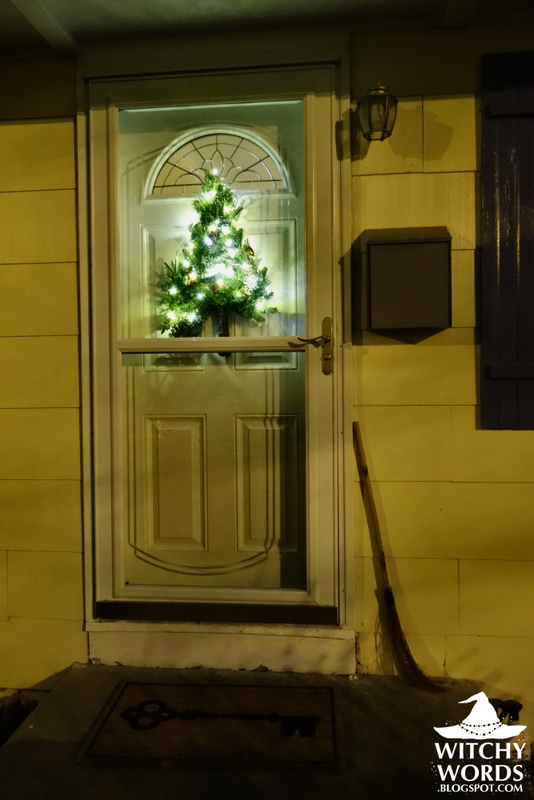 The front door is decorated with a lit Yule Tree wreath and a small broomstick. Side note: The key welcome mat is new and so absolutely me! This is why I want to hang antique keys outside the door. The wreath itself was one heck of a thrift store find mixed with some crafty hands and a store bought item. I found the tree wreath in the pile marked half off of $5.99. It's incredibly heavy and backed with a metal rod around the circumference to keep it sturdy. What a find! However, it originally had no lights. 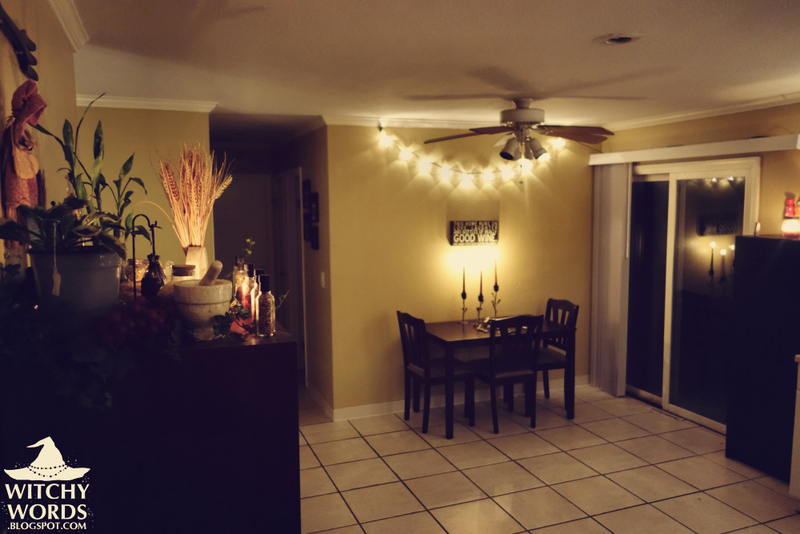 That's why, when I found battery-operated dew drop lights at Target for $8.99, I picked up a set! For $11.50-ish, I couldn't ask for a better wreath. And that sums up our 2014 Yule Decorations! Best of luck to you on setting up your own decorations this year! Love your decorations. I've put up a few, but I don't think I am going to put up a tree this year. My husband is asking for a divorce and it just doesn't feel like Christmas anymore. Why put up a tree if I'm going to be the only one celebrating? I'm so sorry to hear, Lesley! That truly breaks my heart. What awful timing. I'm sure you already know this, but you have friends and family who love you and support you! And I know I'm just a random blogger across the interwebs, but my heart reaches out to you during this difficult time. I appreciate your kind words. It has been a trying couple of weeks, and I am trying my best to keep my head held high.